Love it or hate it, trimming pottery (sometimes called pottery turning) can transform a weighty Earth-bound pot into one that is a pleasure to hold, look at, and use. So it is important for every potter to know how to trim a pot. But it takes some practice to learn the proper consistency for trimming pottery or how much to take off (we’ve all no doubt experienced the horror of trimming through the bottom of a pot we love). In today’s post, Richard Phethean walks through the process of trimming pottery bowls. This thorough guide will help you avoid the pottery trimming blues. – Jennifer Poellot Harnetty, editor. When is a pot ready to trim or turn? It is not easy to give a definitive answer to this question, because the needs of different shapes and sizes of forms, types of clay and wares, and personal preferences of potters are too variable to sum up in a universal rule. The answer ‘when it is leatherhard’ is too general. A better rule to apply would be ‘as soon as the pot is stiff enough to work on without it becoming distorted or damaged’. As a general guide, the base area that will be turned should be soft enough to mark with a thumbnail but not so soft that a fingertip will make an impression. The pottery trimmings should have the consistency of grated cheese – when squeezed in the hand, they will just stick together. If the trimmings are crumbly like grated chocolate, the clay is already on the borderline, and if they are like iron filings, it is too dry. Pick up throwing and trimming tips, techniques, and tools for the pottery wheel, and much more when you download this freebie, Tips, Techniques, and Tools for Getting the Most out of your Pottery Wheel. Trimming/turning tools have a sharp steel edge to pare away the leatherhard clay. Some are all metal with a right-angled blade, others are wire loops—also called ribbon tools—which I prefer. The one I use is a homemade loop of steel banding wire, which can sometimes be found discarded at construction sites. Before you begin trimming pottery, it is helpful to make a few measurements and marks on the form as a guide to where and how much to turn. Set the bowl upright on a flat surface and hold a pencil or stick upright against the rim. Mark the rim height either with a pen or with your finger (see A in illustration at right) on the pencil. Stand the pencil in the center of the bowl, and line up the near and far rims by eye. The difference between the mark and the rim gives you the base thickness at its thinnest point (B). Look down the line of the wall from above the rim. Run a finger and thumb down either side of the wall to where it begins to thicken and mark that point (C). The diameter of the foot-ring will vary according to the shape, width, and style of the bowl, but as a rough guide, it will be between one-third and one-half of the rim’s diameter. Use a pair of calipers to measure this approximately (D). When you begin turning, with the wheel at a medium pace, this caliper measurement indicates the foot-ring width. Lastly, and most importantly, study the curve and line of the bowl’s interior (E). You are aiming to reflect this in the turning and you should keep it in your mind’s eye throughout the process. Richard Phethean’s book Throwing provides a blend of important technical advice with a passion for the making, using, and appreciation of pottery forms. Whether you attend pottery classes, are an enthusiastic amateur, or setting out on a career as a potter, you’ll enjoy a huge amount of pleasure from learning to throw, refine, and finish pots to a professional standard. Place your pot as close to center as you can. Use the concentric rings on the wheel head to guide you, but you may still need to adjust the pot’s position. An invaluable ceramic trimming technique, tapping into center is the fastest way to center a pot (figure 8). However it is difficult to describe and takes practice to learn and do quickly, so try it with a plastic bowl for a few minutes every session. Revolve the pottery wheel at a slow/medium speed and hold a steady fingertip level with the base of your upturned pot, keeping it close enough so that the pot brushes your finger on the widest point of its trajectory. Focus the eye on the edge of the base (where the turning is to be done), not on the rim of the pot. Count ‘1-2-1-2’ each time the pot touches your fingertip to pick up the rhythm. Tap the pot towards the axis of the wheel on the beat ‘1-2’. Tap slightly in the direction of spin. If the pot is small and light, apply light pressure on top of the pot with a finger of your other hand to act as a brake. 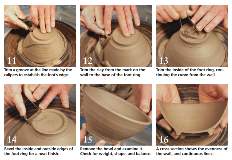 Once centered, stop the pottery wheel and hold the pot firmly with one hand while you press three small coils of clay into place around the rim to fix it to the wheel (figure 9). Use calipers to mark a light ring on the base for the outer edge of the foot-ring (figure 10). With the wheel spinning at medium pace, turn a groove to establish the width and approximate depth of the footring (figure 11). Note how the fingers of the left hand bridge the pot and turning tool throughout, acting as a stabilizer. The speed of the potter’s wheel should be brisk and you should hold the turning tool firmly at a 3 o’clock position, using the slip tray to brace your forearm. Now trim the clay from your marker on the wall (C in the illustration above) to the base of the foot-ring, using the memory of the bowl’s internal form to guide you in terms of the curve you want to achieve (figure 12). Note: When the pot starts getting too dry, the turning tool ‘chatters’ or vibrates on the surface, causing ridges. Dampen the surface with a sponge and continue. Keeping in mind the thickness of the base you measured earlier, trim inside the foot-ring (figure 13), taking care to continue the curve of the form and giving the foot-ring a similar weight, thickness and quality to the form’s rim. To prevent too much downward pressure against the base, use the tool at a very shallow angle. Give the pot a functional and neat refinement with a shallow bevel to the inside and outside edges of the foot-ring, smoothing it with a firm fingertip (figure 14). Before you remove it from the wheel, have a look at the bowl at eye level. Mentally remove the foot-ring and examine the shape. Does it reflect your memory of the interior form accurately? Now remove the lugs of clay and look at the bowl (figure 15). Rock it from side to side in your cradled hands. It should feel balanced, not bottom-heavy, its weight evenly distributed. Run a thumb and forefinger down either side of the wall to feel for thicknesses. Compare the interior and exterior curves. Look at the pot in section, to examine the evenness of the wall (figure 16). Notice how the shape now corresponds inside and out, as well as the subtle but vital increase in weight at the foot-ring and the rim. Richard Phethean has been a potter for more than 30 years. He has been teaching at University of Westminster, Harrow College since 1995 and a Resident Potter at Sibford School since 2001. This article is an excerpt of his book Throwing, co-published by The American Ceramic Society and A&C Black, London. advice, american ceramic society, base, bound, bowl, bowls, calipers, ceramic, classes, clay, coils, consistency, dry, edges, focus, foot, foot ring, form, forms, functional, guide, homemade, how to trim a pot, illustration, iron, learn, lugs, marks, memory, position, pot, pots, potter, potters, pottery, pottery bowls, pottery classes, pottery forms, pottery trimming, pottery turning, pottery wheel potters wheel, process, question, rims, set, setting, shape, slip, sponge, surface, teaching, technical, technique, thickness, throw, throwing, time, tool, tools, tray, trimming, trimming pottery. I just tap the pot and you can hear where still needs clay removed and where it is thinner. Probably your clay was not perfectly centred and one side of the rim is higher. You need to skim off the top of the base so that it is perfectly level before you continue with turning. Then your footring will come out level and so will the rim of the piece when you turn it back over. I have a bamboo skewer, marked from the flat end in cm. which I use in place of the pencil. Place a ruler with several openings in it across the top of the pot, slip the bamboo skewer through a hole lined up with the centre bottom of the pot and take the measurement. Then place the skewer through a hole in the ruler just outside the pot and take another measurement. The difference is the depth of your pot at the centre. Try using a thumb tack in the inside bottom and trim until your tool hits that tack. I just learned to poke a needle tool through the bottom and side to get the thickness. Then fill the holes. It works too. What causes unevenness in the height of the foot ring? Could it be my wheel is not level when I am throwing? Richard, thank you so much for this article. I can’t believe after all the years I’ve been potting that I didn’t know, or couldn’t figure out the pencil trick for figuring out the depth of the bowl bottom. I always trim leaving a foot ring and have lost many a bowl because of a bottom too thick or too thin. Leather hard or cheese hard , the definition is quite simple – the clay should have lost its glossy sheen and be firm enough to touch or handle without leaving finger marks or distorting the form – it should be like hard cheese. If its too soft the clay will pull away rather than leave a crisp, clean cut, also the turning too needs to be sharp (if using metal tools) The best turning tool, for me, is a stanley knife blade. Lucie Rie used a razor blade – I prefer the relative safety of the Stanley blade – because it has a fine cutting edge it leaves a crisp clean cut, and holding it in the fingers gives a greater cutting control and feel for the clay. Over time you will develop the skill to gauge the thickness of the pot wall simply through the finger tips, until then a thin pin or needle can be used – the pin hole can be filled in easily without and visible signs. Turning can be a very decorative effect, it is not solely used for cleaning the lines of the form.